Silver-lined seed beads. Each student will need less that a half-tablespoon of size 10/0 seed beads. 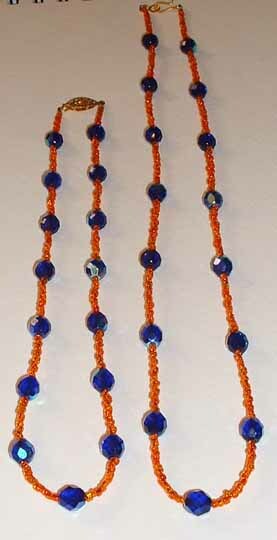 Or you could use small plastic or glass pearls instead of the seed beads. Samples of 16" and 24" Crystal Necklaces. The sample necklaces give the kids a chance to try on different lengths and choose which length to make. I made up lengths of beading wire with one side of a clasp crimped into place on one end, so the wires were all ready to be beaded. The Class: See Sparkly Thing. Own Sparkly Thing. One of the themes that the sponsoring group had for these classes was to get the girls to make things as gifts, as well as things for themselves. There would be a gala graduation event at the end where we would get together with girls from other agencies who were working on other types of crafts and show off our work, and perhaps give a gift to a parent. While everyone was looking forward to the graduation event, there was less enthusiasm for making things to give away. "See sparkly thing. Own sparkly thing." That was more the mood of the girls in my class. And who could blame them? We all fall for the beaded goodies, don't we? I showed them two samples of the crystal necklace, each using the full allotment of 15 fire-polished beads, but with differing numbers of seed beads between them, resulting in 16 inch and 24 inch necklaces. The 16 inch necklaces used 10 size 10/0 seed beads between each fire-polished bead. Since I had figured out by that time that the girls would enthusiastically take a lot of beads which would then get all mixed up with their neighbors' beads, leaving a mess at the end, I measured out a half tablespoon of the seed beads in the color each girl chose and let them each pick one bag of 15 fire-polished beads. Most of the girls copied one of the sample necklaces, in colors that suited them. When the necklace was completed, I handled the crimping and trimmed of excess wire. While trimming the wire, I accidentally cut one girl's necklace and about half the beads on it flew across the floor. I apologized -- a lot -- and helped her get it restrung and properly crimped and trimmed. Since I had measured out the beads, the mess at the end was less than the first week. I just threw away the beads that were left on the tables while one of the girls wielded a broom and cleaned beads off the floor. Once everything was cleaned up, we looked at samples for the next class, a knotted necklace on linen or leather cord.